Summer is right around the corner and the weather is starting to heat up in SoCal! With triple digit temperatures on the way it's great to know McDonalds has some delicious new treats to help us foodies keep cool! 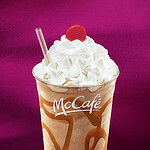 The latest product on the McCafe lineup is the new Dulce de Leche shake! Sounds absolutely fabulous right? 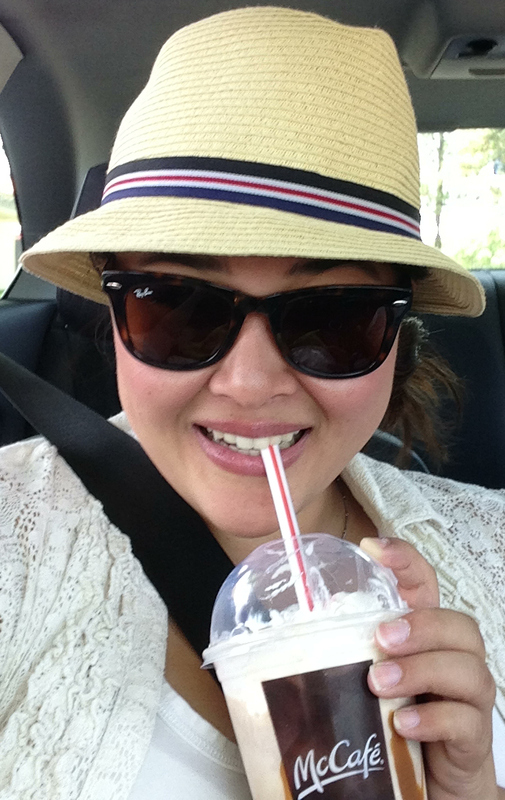 My sister and I tried the McCafe Dulce De Leche shakes over the weekend and they were crazy delicious! I swear we're sisters, even though we look nothing alike! As you can see, McDonalds is pretty generous with the caramel in this Dulce de Leche shake, the shake itself is caramel with even more caramel drizzled throughout the shake! It's a caramel lovers dream! What surprised me about this shake was how it wasn't overly sweet. Usually with a flavor like Dulce de Leche you sometimes end up with a super sugary dessert that either makes you sugar crash later or get that almost sickly sweet feeling. That wasn't the case with this shake at all! We paired our shakes with an order of fries, because salty fries and a shake are one of the food world's greatest pairings. No, it's totally not weird to dip your fries in your shake...right? Either way, we loved this shake and are glad to have a new sweet pick-me-up for the Summer season! We want you to have a chance to taste McDonalds Dulce de Leche McCafe Shake too! We're giving away a prize pack to three lucky winners! Each prize pack contains four Dulce de Leche McCafe Shake vouchers to enjoy with your friends along with some other fun surprises! Enter using the rafflecopter widget below! I'd drink it to cool off on a hot summer day! their McCafe drinks are so good! I would love this on a super hot day! Sounds perfect! Would love this on a day like today! Super hot today! I would love it as a mid workday treat! I've always loved McD's ice cream treats... recently tried their Pomegranate Smoothie and oh my..
Looks yummy! Perfect for the summer too! I would enjoy this to cool down! Definitely as a weekend mid-day treat!